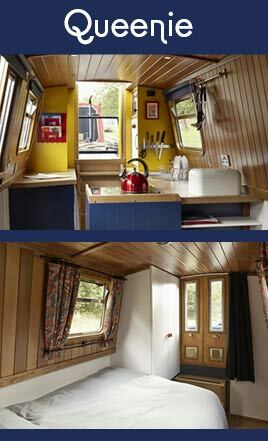 Hire a narrowboat in England for a superb canal boating holiday! 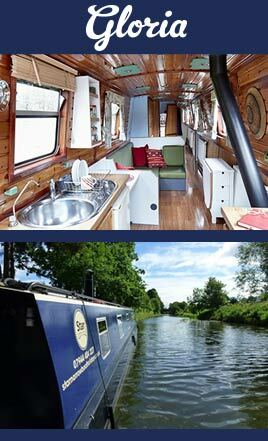 Star Narrowboat Holidays have two canal boats to hire all year round. We keep the same price all year too and our hire prices are inclusive of fuel. We also offer flexibility on hire start dates and duration. Thinking about cruising the Cheshire Ring? Or a trip to Llangollen and back? Across England and the UK there are canals stretching for thousands of miles and by hiring a narrowboat you will get a chance to discover the waterways and the British countryside. If you are new to canal boat hire and holidays no problem - we will teach you how to handle the boats, offer advice on what routes to take and we’ll make sure you feel ready to go off on your own (to start with the Bridgewater canal has no locks). A canal boat holiday aboard Gloria or Queenie can be as relaxing or as active as you choose. Amongst the available routes you will have access to the Cheshire Ring, the Four Counties Ring, The Anderton Boat Lift, Liverpool city centre, the Rochdale canal, the Leeds Liverpool canal, the Trent and Mersey and the Lancaster canal and Llangollen.....therefore you can explore the North West of England. We also offer static houseboat hire on our linear moorings at the Bridgewater Marina/Boothstown Basin M28 1YB - 9 mi/14 km from Manchester city centre & 14 mi/22 km from Manchester Airport. From November to March each year 'Gloria' is available for a continuous, static, houseboat hire only - have you ever fancied living on a houseboat? 'Queenie' will still be available for regular hire. For any questions about how to hire a canal boat with Star Narrowboat Holidays please get in touch. Please note that we do not offer day hire!